Hose products in storage can be affected adversely by temperatures, humidity, ozone, sunlight, oils, solvents, corrosive liquids and fumes, insects, rodents and radioactive materials. The appropriate method for storing hose depends to a great extent on its size (diameter and length), the quantity to be stored and the way in which it is packaged. 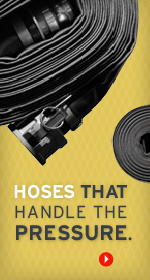 Hose should not be piled or stacked to such an extent that the weight of the stack creates distortions on the hose lengths stored at the bottom (plastic hoses are very susceptible to this on hot days). Since hose products vary considerably in size, weight and length, it is not practical to establish definite recommendations on this point. Hose having a very light wall will not support as much load as a hose having a heavier wall or hose having a wire reinforcement. Hose shipped in coils or bales should be stored so that the coils are in a horizontal plane. Whenever feasible, hose products should be stored in their original shipping containers, especially when such containers are wooden crates or cardboard cartons which provide some protection against the deteriorating effects of oil, solvents and corrosive liquids; shipping containers also afford some protection against sunlight and ozone. Certain rodents and insects will damage hose, protection from these elements should be provided. The ideal temperature for storage of hose products ranges from 50°-75°F(10-24°C) with a maximum of 100° (38°C). If stored below 32°F (0°C) some products will become stiff and will require warming before bending or being put in service. Hose product should not be stored near sources of heat, such as radiators, heaters etc. Nor should they be stored under conditions of high or low humidity. To avoid the effect of ozone, hose should not be stored near electrical equipment that may generate ozone. Direct or reflected sunlight even through windows should be avoided. Florescent or mercury lamps may create light waves harmful to hose. Protection from such lighting should be provided. Items should always be stored on a first in first out basis, even under the best of conditions, unusually long shelf life could deteriorate plastic or rubber hose.